The cash flow statement is usually prepared LAST of all, after the Income Statement, Statement of Owner’s Equity and Balance Sheet. It shows how cash is generated and used by business entities throughout a certain accounting period, i.e. where the cash has come from and exactly what we have done with it during the year. 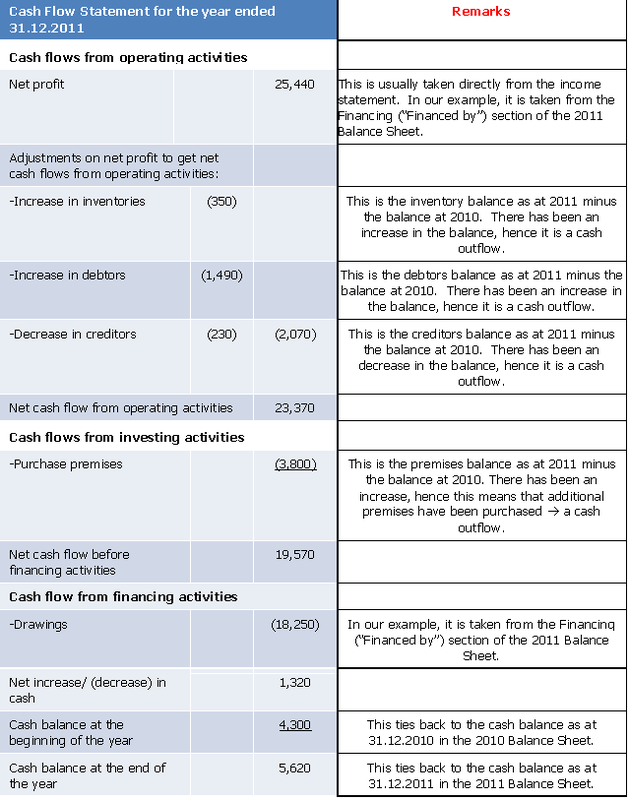 Why have a cash flow statement? Because it is the only financial statement that shows actual cash movements. The income statement, which shows the profit or loss of the business, does not give an accurate picture of the economic position of a business because some items do not involve cash – such as accrued revenue and expenses. Certain provision accounts (like Provision for Doubtful Debts or Accumulated Depreciation) also do not involve cash movements. Therefore, cash flows highlight shortages in cash even though a business may be making profits. OK, let’s deconstruct the cash flow statement. It’s divided into 3 main sections: operating activities, investing activities and financing activities. These refer to cash transactions that affect the revenues and expenses, and therefore influence the net profit/loss of the business. 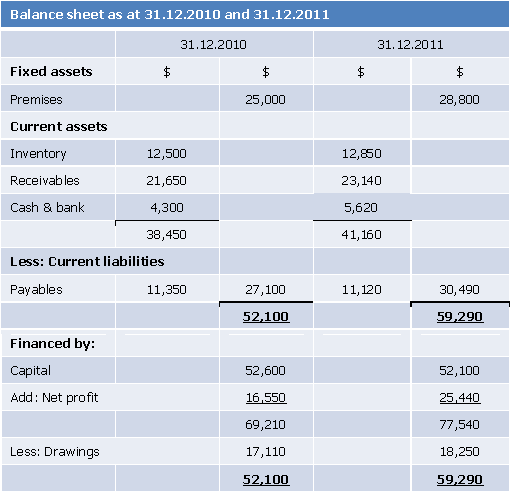 They involve items in the income statement, and current assets and current liability (from the balance sheet). Cash inflows arise when current assets (CA) decrease (over the accounting period), current liabilities (CL) increase and when profits are made. Conversely, cash outflows arise when current assets increase, current liabilities decrease and when losses are incurred. Cash in - decrease in current assets. Let’s take an example of a current asset, say accounts receivable. When accounts receivable decreases, it usually means that debtors have repaid their debts, which then means that money has come in. Hence, there is a cash inflow. Another example of decrease in current assets - decrease in inventory/stocks. The decrease is usually because inventory has been sold, which again means that cash proceeds have come in. Hence, there is a cash inflow. An example of a current liability – let’s say accounts payable. An increase in accounts payable means that money has been “borrowed” from creditors (in the form of goods not yet paid for), and hence there is a cash inflow. Cash out is represented by an increase in current assets. Again, let’s use the example of accounts receivable. An increase means that debtors have “borrowed” money from the business, which means money has gone out. Hence, there is a cash outflow. Similarly, an increase in inventory means that more inventory has been purchased – also means that money has gone out for the purchase. A decrease in current liabilities, say accounts payable, means that money has gone out to repay the creditors. These refer to acquiring and disposing of long-term/non-current assets (or fixed assets (FAs). So, very simply, when fixed assets are sold, cash comes in. When fixed assets are purchased, cash goes out. Here, cash may be obtained from investors (in the form of additional capital, or the sale of shares). Also, cash may be obtained from the taking of long-term loans from external parties (bank loans, bonds, debentures, etc). Conversely, cash may be taken out when the loans are repaid, or when investors take out cash from the business in the form of drawings, or dividend payments. There are 2 methods of constructing a cash flow statement - indirect and direct – but we will focus only on the indirect method as it is the one that is utilized the most. Let us look at a working example.